Bindings are next on your gear list to connect your fabulously fitting boots to your cool new skis. Advances in skiing technology make bindings more than just a connector; they can help save your knees in a fall, promote better edging for faster racing or make skinning up a mountain easier. On a basic level, bindings hold your feet to you skis, releasing them when you fall. 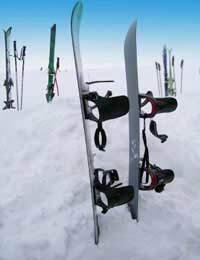 Bindings consist of four major components: the toe piece, which traditionally releases sideways; the heelpiece, which releases upward and sometimes laterally; the ski brakes, prongs that straddle the ski prevent it from torpedoing down the hill when not on your foot; and anti-friction devices, pads under the forefoot that ensure boots release easily. Every binding is slightly different from design to releasing systems. Talk with your salesperson honestly about your skiing ability to help decide which system is appropriate for you. Your boot fitter may suggest brands with specific toe or heel heights to better align your legs. Lifters can be beneficial for bow-legged and knock-kneed skiers allowing them better alignment over their edges. Racers and sometimes beginning-parallel skiers like added leverage for increased edge angle that lifters provide. However, beware of too much lift, as it makes the skis heavy and less versatile. Marker binding manufacturer recommends no more than 12mm for 95% of skiers. Oppositely, Jibber’s bindings need to be lower to the ski for easier rail sliding. Because bindings absorb shock, dampen vibration and reduce fatigue, how they are mounted to your skis can affect your performance. Mounting bindings closer to the center typically balances fore and aft pressure. Generally, Women’s bindings are mounted forward of center to compensate for their center of mass being behind them. Knee injuries most often occur when a skier falls backwards, twisting. To help minimize injuries the ski binding industry has made advances in how the toe and heelpieces react when pressure is applied. Look originated the Pivot turntable heelpiece, designed with a lot of elastic travel automatically re-centering you, allowing more time to recover before it releases. The release point beneath the tibia/fibula shaft puts less stress on the leg and therefore knee before freeing the foot. To more effectively release in a backward-twisting fall, Line’s engineering team came up with a binding that claims to release the heel laterally, instantly easing the knee strain. Marker has advanced the simple anti-friction plate to a gliding system that slides laterally with the toe-wings, setting off Marker’s Biometric "programmed upward release" that minimizes stress on ligaments, hopefully saving your ACL and MCL. With the knee safer, engineers have focused on other improvements such as decreasing weight, and increasing the ski’s ability to flex uninhibited. Atomic has even come with an adjustable binding that skiers can change depending on terrain. The newest direction in ski technology comes in the form of an integrated ski and binding system. Many ski companies created integrated systems, as a way to get past the flex issue. The combination creates a movable binding that allows the ski to flex properly, maintaining edge contact through the whole ski for better balance and control. The wider binding plates also make it easier to get on-edge and transmit power through the ski more efficiently enabling more powerful, controlled turns. The joy of backcountry skiing comes from sliding down an untracked slope away from any signs of civilization. Unfortunately that often means time spent post-holing up and over ridge after ridge. Skinning, skiing uphill with synthetic hairs attached to your ski, make backcountry travel much easier, but is nearly impossible in alpine bindings. Randonee, or Alpine Touring (AT), bindings provide a free heel with a lever that elevates your foot to different positions for easier climbing on variously steep slopes, and then locks down for making alpine turns on the decent. Stiff lateral construction is important for AT bindings, and advances in technology have created toe pieces that release like those in alpine bindings. Attaching your feet to skis is as important as buying the right skis and boots. Checking out integrated systems, knee-safe technology and lifters will provide you with the best option for your skiing package. And if staying near lifts, snowcats or helicopters is not always possible, set up your second pair of skis with randonee bindings.